Because of the much lower duty on LPG, running costs are nearly halved. For an average car user, the cost of conversion can be recovered in less than 2 years. 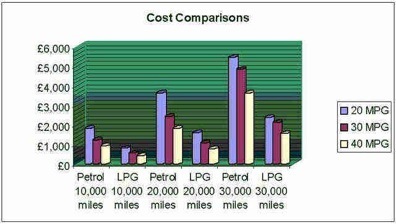 The following chart shows the typical cost saving of vehicles averaging 20, 30 and 40 miles per gallon. The prices used in the above illustration are 80p per litre for petrol and 35p per litre for Autogas.